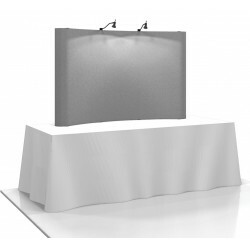 Pop up table top displays are mini versions of their full size counterparts in convenient sizes that allow you to set up professional looking table top displays in minutes. The light weight materials make these kits highly portable, quick and extremely simple to set up and take down. Each kit comes with an option of either premium or economy graphics. Premium graphics are printed on 12 mil opque polyester film with a 10 mil polycarbonate laminate and feature the greatest durability and image quality. Economy graphics are UV printed on a 15 mil opaque textured polyester film, offering very good image quality and durability without the need for lamination. Some extra care must be taken with unlaminated graphics to keep them looking good, but this type of graphic has become the industry standard and it's a great option for short term use or for those who are able to handle the graphics more carefully when setting up and packing the display. For help in choosing a display or for advice, please contact us.